Ahhh…it’s so great to get back on the water again! That was definitely the consensus this weekend as we kicked off our first trip of the season. The weather was very typical Haida Gwaii –a constant cycling of sunshine, showers and layers of clouds moving through all day and night! Normal is good. The early season fishing has been similar to last year with teen-sized feeder Springs dominating the catch. The action wasn’t hot, but most anglers bumped into a few over the course of the trip. The best concentration of Chinook action has been on the eastern side of our fishing grounds with most boats working the inshore waters from Inskip Point around past Cape Edenshaw to Slab Rock. Anchovy / flasher combinations or small spoons fished down 30 to 35 feet have been most productive. We’ve seen a number of nice Springs in the low to mid-20’s but we’re awaiting the first Tyee of the season. Sandy O. came close with this beautiful 25 pounder! Any day now! Moderate southerly winds on Saturday and Sunday saw most boats exploring the offshore waters to pick up some tasty halibut and lingcod. We were finding lots of nice chickens for the fish box and, as usual, some anglers got a little more than they bargained for! 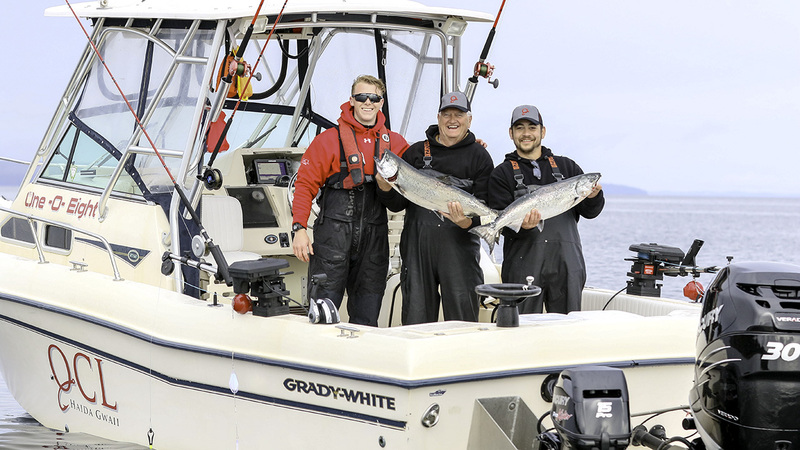 Our halibut fishery has emerged in recent years as some of the most exciting fishing out there and, true to that tradition, we recorded 4 fish over 100 pounds on our opening weekend. 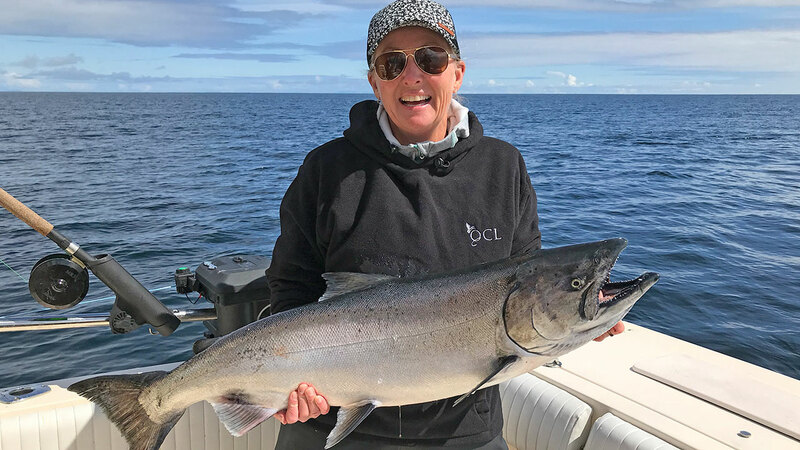 The size champ of the season so far is Lorri S. (who not only bagged a perfect 22-pound Chinook) but also hauled up a classic “barn door”halibut that taped out to 75 inches –that’s 220 pounds! Fabulous fishing Lorri! 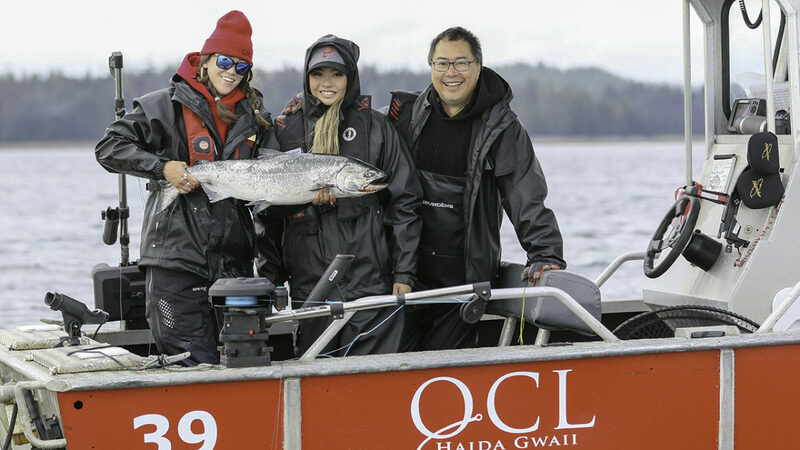 Keeping “girl power”in the forefront, Aubrey C. brought a 108-pounder to the boat. 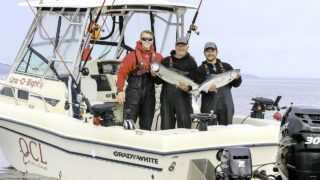 A 59-inch halibut for Jesse C. scored out to 105 pounds and John L’s big slab on Sunday was in the same league, coming in right around the 100 pound mark. Jesse’s wife Marla was also in the running on Sunday when she landed a 57-inch halibut for a score of 93 pounds. The nice thing is that all of these very memorable fish (all females) went right back down to carry on with the business of making more halibut! Fish stories to last a lifetime! Making the most of that great fishery, today we kick off our second annual Jig-a-Pig Derby –dedicated to those who have a thing for jigging! No doubt the Tyee Bell will be ringing a lot this week with tales of mighty battles going on out on the grounds! We’ll keep you posted.